I recently went on a field trip to a major retailer's distribution center. I sat in with the newest recruits during orientation to see how the safety manager trains each site employee to move nearly seven million (!) pounds of product every year. The safety community is the compliance community's close cousin— and they're way ahead of us on operationalization. Safety professionals work in a highly specialized, highly regulated field, with the goal of helping the organization’s employees do their jobs a certain way. If that sounds familiar to you, good. It should. Both the safety and compliance communities have similar end goals: translate their expertise to pragmatic guidance focused on what people actually do, to help them do those things the right way. And safety has been doing this for a long time—so I wanted to see what I could learn from how they do it. And so here are the six things I learned about safety—and why they matter for compliance. #1: The safety team doesn’t talk about “operationalizing safety," because all safety is operational. There is no such thing as non-operationalized safety; the idea that you would give abstract safety training is just silly. Safety has to be a part of how employees do their jobs, otherwise safety doesn’t happen— injuries do. That’s right. “Safety” is not something they do; it's a result of how an organization runs, just like “compliance” is another type of result. #2: The safety orientation covered topics that were relevant and critical to every employee in the room. All of the safety training was operationalized because it all mattered. No one was trained on parachuting techniques or water-landing evacuations, even though those are important safety topics for another audience. 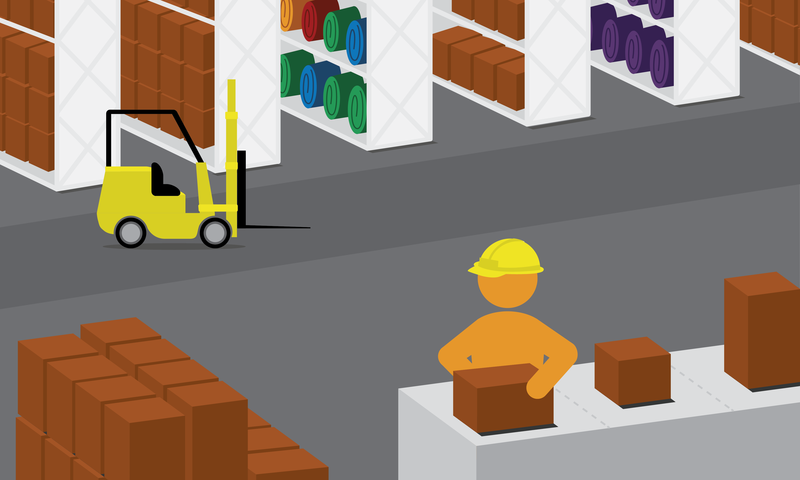 Task-focused training made it easier for the employees to understand how it was relevant to their warehouse jobs— because it was about their jobs! #3: Safety folks focus on behavior, not theory; they help employees unlearn old habits and form new ones. Reinforcing what’s learned in orientation, managers lead daily safety topics, because they are focusing on habits and not quizzes or games. This also helps get the necessary buy-in from managers that safety policies and behaviors are relevant to their teams’ jobs. #4: You don't have to convince a safety professional about "real-time" training—that is, putting the instructions right where they’re needed. Why? Because it’s common sense. Need to know how to clean up a spill? They post signs directly on the warehouse racks so that employees know exactly how to handle the situation right where it’s likely to happen. Need gloves and a mask to perform a task? They’ve stored them where the task is performed. Not sure how to safely lift 50+ pounds? They’ve got banners worthy of an NBA Championship hanging above the warehouse floor. And notice that all of this happens offline. We often hear people ask "we get how you would integrate real-time training into Oracle, but what about offline stuff?" Well, risky offline stuff usually happens in predictable places, or triggered by predictable events, where you can make offline guidance available too. There will always be things you can't predict because they've never happened before...but those are things that compliance programs can't reasonably prevent anyway. #5: The safety team is great at monitoring and remediating situations. Safety folks count employee on-the-job injuries and illnesses. Training is conducted to prevent trending types of injuries. They do not worry about how to measure if their training works because that's what their monitoring does. #6: They make business cases for new programs, test with training pilot programs, and demonstrate results to leadership. The business case for safety isn’t just made up of injury and illness rates. Costs like medical bills, lost time, days away from work, restricted work, or transfers to other jobs also factor in. These are all easily measurable because there’s a paper trail. And they can be measured again to prove their safety program works. All of this certainly didn’t happen overnight. But the safety profession has created a methodical, common sense approach to changing employee behavior. 2. Make time in your schedule to take your own field trip with your safety team. See how you can translate their organizational success into your own compliance program. They’re familiar with how to operationalize behaviors (you know, create a culture of safety and compliance). 3. Be open to thinking outside the box— that is, the proverbial Compliance Box— for answers to compliance problems. A fresh perspective on a similar concept might be what you need to kickstart change at your organization. Courtney is a Certified Compliance & Ethics Professional and holds a master's degree in Applied & Professional Ethics. She was an in-house E&C manager at a World's Most Ethical Company Honoree and a FTSE 100 company. Yes, you can actually be "done" with compliance training—here's how.